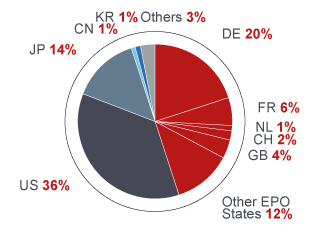 This graph shows the geographic origin of the European patent applications1 filed with the EPO. The geographic origin of the file is determined by the country of residence of the first applicant listed on the application form (first-named applicant principle2). 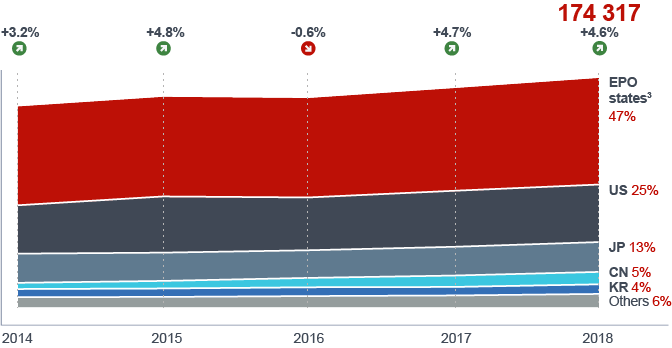 1 European patent applications include direct European applications (Direct) and international (PCT) applications that entered the European phase during the reporting period (PCT regional). 2 This is determined by the country of residence of the first applicant listed on the application form (first-named applicant principle). In cases where several applicants are mentioned on the application form, the country of residence of the first applicant listed applies. 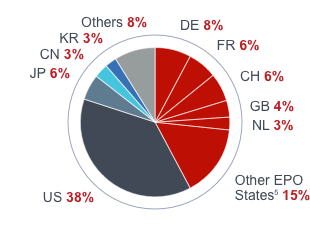 This graph shows the geographic origin of the European patent applications1 determined by the country of residence of the first applicant listed on the application form (first-named applicant principle2). 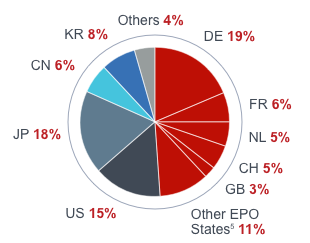 1 European patent applications include direct European applications and international (PCT) applications that entered the European phase during the reporting period. 2 This is determined by the country of residence of the first applicant listed on the application form (first-named applicant principle). 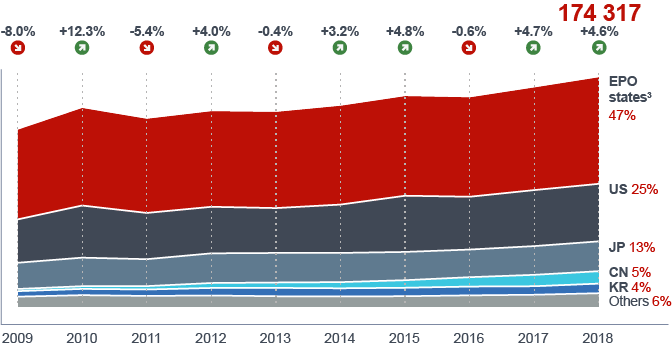 This page shows the number of European patent applications1 filed with the EPO for the ten technology fields2 with the largest number of applications in 2018. 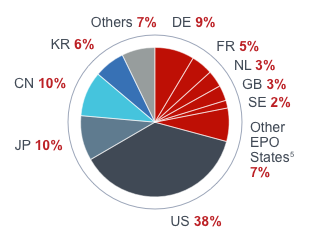 In 2018, these top ten fields represented 53% of the total number of European applications filed. Each technology field has its own page providing an analysis of the geographic origin of the files. The geographic origin is based on the country of residence of the first applicant listed on the application form (first-named applicant principle3). The pages also rank the largest applicants4 in each field. 3 The geographic origin is based on the country of residence of the first applicant listed on the application form (first-named applicant principle). In cases where several applicants are mentioned on the application form, the country of residence of the first applicant listed applies. 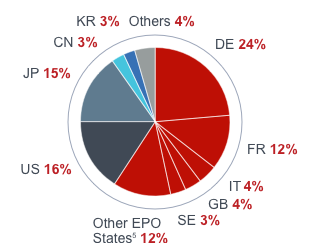 4 This is the ranking in each technology field of the main consolidated applicants at the EPO in 2018 (first-named applicant principle). 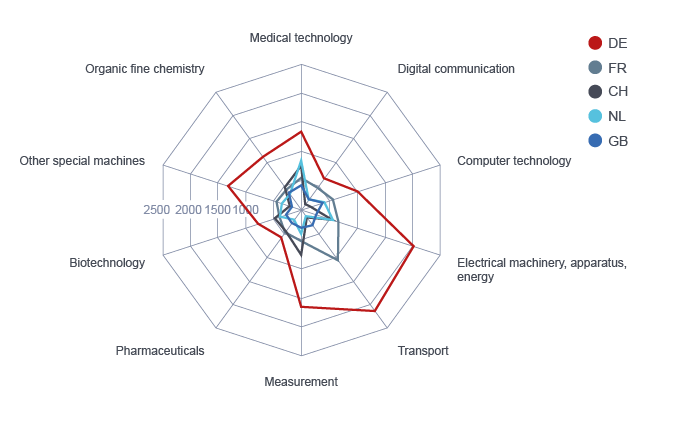 It is based on European patent applications filed with the EPO in each technology field. It includes direct European applications and international (PCT) applications that entered the European phase. Applications by identifiable subsidiaries, not necessarily located in the same country, are allocated to the consolidated applicants. This field encompasses lighting devices, power and electric energy supply systems, basic electric elements and techniques. Some specific examples of technologies in this field are power cables, magnets, relays and x-rays techniques. 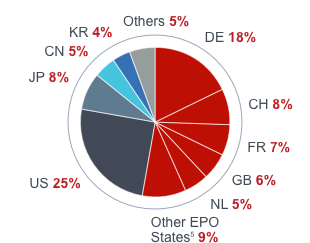 5 EPO states: the 38 member states of the European Patent Organisation, which includes the 28 states of the EU. The field of Medical technology covers medical instruments for diagnosis, treatment of diseases and surgery. Technologies included in this field are, for example, vaccination instruments, prostheses, surgical robots, computed tomography and pacemakers. This field encompasses basic electronic circuitry and electronic communication. The field includes, for example, amplifiers, decoders and telegraphic communication. 2 The geographic origin is based on the country of residence of the first applicant listed on the application form (first-named applicant principle). In cases where several applicants are mentioned on the application form, the country of residence of the first applicant listed applies. 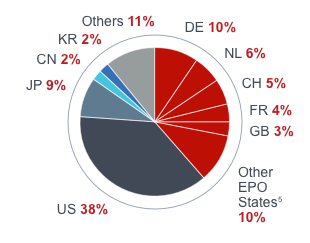 4 This is the ranking in each technology field of the main consolidated applicants at the EPO in 2017. 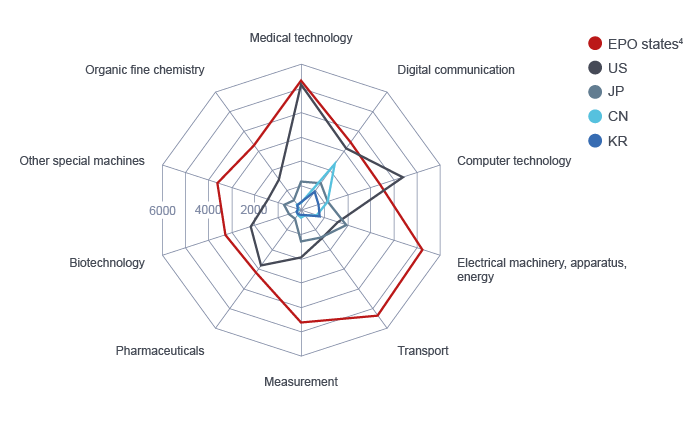 It is based on European patent applications filed with the EPO in each technology field. It includes direct European applications and international (PCT) applications that entered the European phase. Applications by identifiable subsidiaries, not necessarily located in the same country, are allocated to the consolidated applicants. This field encompasses computing, calculating and counting devices. It includes, for example, digital computers and data processing systems. 6 Guangdong OPPO Mobile Telecommunications. This field encompasses vehicles, and more specifically vehicle tyres, wheels, windows and roofs, railway systems. This field encompasses horology, devices for measuring position and displacement, more specifically clocks and watches, navigation systems, volume, liquid and sound measuring devices. 6 Commissariat à l’énergie atomique et aux énergies alternatives. This field encompasses organic pure substances, combinatorial chemistry, and preparations for medical, dental and hygiene uses. It includes, for example, steroids, sugars, cosmetics, pharmaceuticals and food ingredients. This field encompasses combustion engines, engines and pumps for liquids, eolic energy, nuclear physics and engineering. It covers, for example, gas-turbine plants, pumps and pistons, fusion and nuclear reactors, x-ray microscopes and wind motors. This field encompasses preparations for medical, dental or hygiene purposes, for example emulsions, dragees and amalgams. 6 Institut national de la santé et de la recherche médicale. This field encompasses peptides, microbiology and genetic engineering. Included in the field are, for example, genetically modified organisms, brewing of beers, preparation of wine and vinegar. The field of “other special machines” covers machine tools for agriculture, textile, paper, food (i.e. sugar industry production), shaping of plastic, cement and clay, as well as manufacturing of 3D objects. This analysis shows the number of European patent applications1 filed with the EPO in the different technology fields2. This analysis reflects the number of European patent applications filed1 with the EPO in each of the top ten technology fields3 for each of the main countries of origin2. 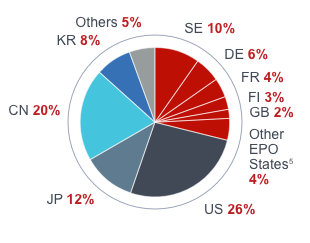 1 European patent applications filed include direct European applications and international (PCT) applications that entered the European phase during the reporting period. 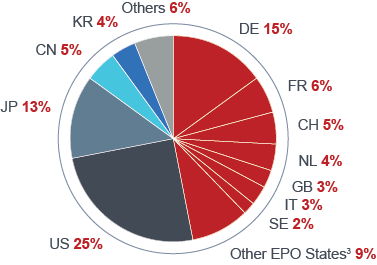 4 EPO states: the 38 member states of the European Patent Organisation, which includes the 28 states of the EU. 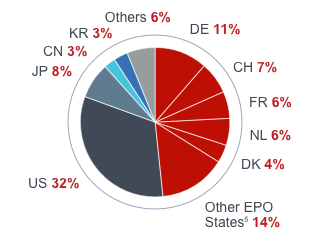 This analysis shows country ranking2 based on the ratio of number of European patent applications filed with the EPO1 per million inhabitants3. The ratio per million inhabitants is for countries with a population of at least 1 million inhabitants. 3 Source of population figures: U.S. Census Bureau, International Data Base.